There are 4,620 square miles in Lane County, roughly the size of the state of Connecticut or of the states of Delaware and Rhode Island combined. 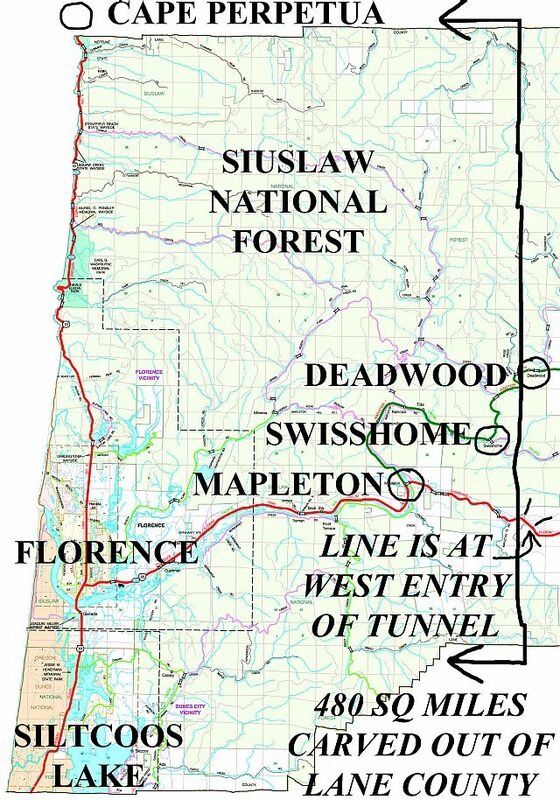 The proposed Siuslaw County area is starting with the surveyor's Township-Range-Section line nearest the western end of the tunnel going north and south to the county line as the eastern boundary of coastal Lane County. Specifically, the coastal area within Lane County is defined by Townships 15S to 19S (north/south) and Ranges 9.5W to 12W (east/west). This rough boundary is expected to be further refined as the process of county definition proceeds. The coastal area includes the towns of Florence, Dune City, Mapleton, and Swisshome. Cape Perpetua is just above the northern boundary of Lane County while the southern boundary is across the lower portion of Siltcoos Lake. If in doubt, pull out your tax statement looking at the "MAP & TAX LOT" to view the TT-RR-SS-LL-LLLLL. (Township-Range-Section-Lot). Those in coastal Lane County area have a Range of tt-12-ss, tt-11-ss, or tt-10-ss. 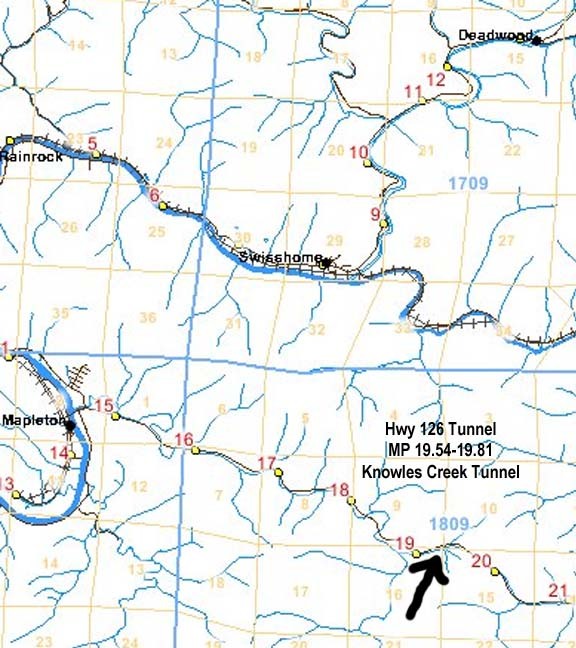 Half of Range tt-09-ss is also in the area; so, look for a Section of: 04 through 09, 16 through 21, or 28 through 33. So 15-09-18-00-01011, being Township 15 Range 09 Section 18 Tax Lot 00-01011, is within the study area. If any community adjacent along this line and within Lane County wishes to be excluded or included, they are asked to present their cost/expense/benefit case to those directing this effort. To be assured it is the majority consensus of that community, eventually a signed petition may be requested. Once the petition to form the new county is approved, no further line adjustments will be possible. Our funding goes to/from Lane County; so, those in adjacent counties are not part of this effort at this time. In past efforts, the coastal area of Douglas County just south of Lane County has shown interest. Once Siuslaw County is subdivided off Lane County, folks adjacent to it from any surrounding county will be able to petition and vote to combine with us as provided in the Oregon Revised Statutes.